This idli dosa batter recipe will help you learn how to make the best batter for idli and dosa at your home including notes on how to make idli dosa batter in cold countries (see note section in recipe card). Idli is a kind of steamed rice cake, and it is one of the most popular South Indian breakfast items, which you can find in almost every restaurants and homes and dosa is Indian style thin pancakes. The basic ingredients used in the making of idli dosa batter are rice and urad dal and we see here the measurements of rice & urad dal used to make the batter with the ratio and different proportions explained. Idlis can be prepared in different ways using different ingredients, but today I am sharing the best and easy way to make idli dosa batter recipe to prepare traditional rice idli and dosa, which are the most popular in the South Indian breakfast menu. As the rice idlis and rice dosas (not all idlis and dosa are made from rice, see wheat dosa recipe here and see instant rava idli recipe here which are not gluten free) it is prepared from only rice and dal, they are healthy and gluten free. Idlis and dosas are also rich in protein due to the use of dal. And most importantly, idli and dosa are made from naturally fermented rice and dal, which is even better for good digestive health. Fermented foods are believed to be good for health. The serving size of this idli dosa batter shows 48 idlis or dosa which means you can make around 48 idlis or dosa using this amount of batter prepared at home. So here is how you can make idli dosa batter at home to make delicious South Indian style idlis and dosa following this easy idli dosa batter recipe. 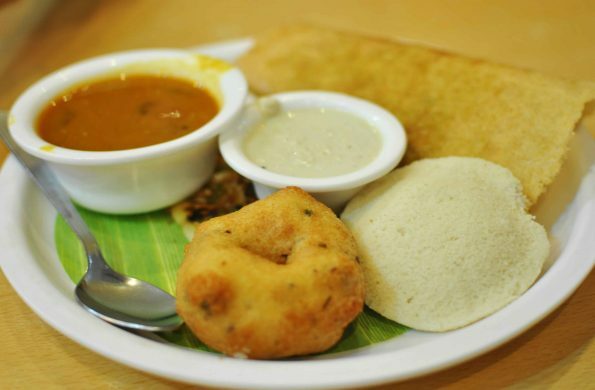 Idli and dosa are healthy, delicious South Indian breakfast items so popular in India. You can easily prepare idli and dosa at your home following this recipe to make the idli dosa batter, using rice and urad dal which are healthy and gluten free too. Wash the rice and lentils (urad dal and fenugreek seeds) separately, and keep them aside in different vessels. Soak rice in water. You can use water just enough to cover the rice. In another vessel, soak the lentils. Again, use water just enough to cover the lentils. Keep them closed for at least 6 to 8 hours. You can even keep them soaked up to 12 hours. Soaking the rice and lentils in water for hours, will result in fermentation of the grains and dal. Once they are soaked, you do not have to remove the water as you can use the same water to grind rice and lentils. Grind the rice in a blender along with the cooked rice, then grind the dal separately. If you are making the batter for idli, make the batter with very little water (just enough to make athick batter) since its not possible to make idlis with a runny batter. If you are using poha instead of cooked rice, you have to soak the poha for about 30 minutes prior to grinding the ingredients. You can soak the poha in the same container with rice, but soak it just thirty minutes before you grind the contents. Adding cooked rice or poha will make the idli (or dosa) more softer in texture. Mix both the grind rice and grind urad dal, add salt and stir well to get the idli batter. The mixture should be thick enough to pour them into the moulds and make idlis. You need to keep this for fermentation for at least 8 to 10 hours or overnight, after which the batter will increase in volume so make sure to use larger containers to keep the batter. Once the batter has increased in volume, you can mix well and use it for making idlis. This is how you can prepare the best idli batter recipe at home. To get the best results, try to use the idli rice itself and very fine quality ingredients, also make sure you follow the right proportions and directions as mentioned in the recipe here. 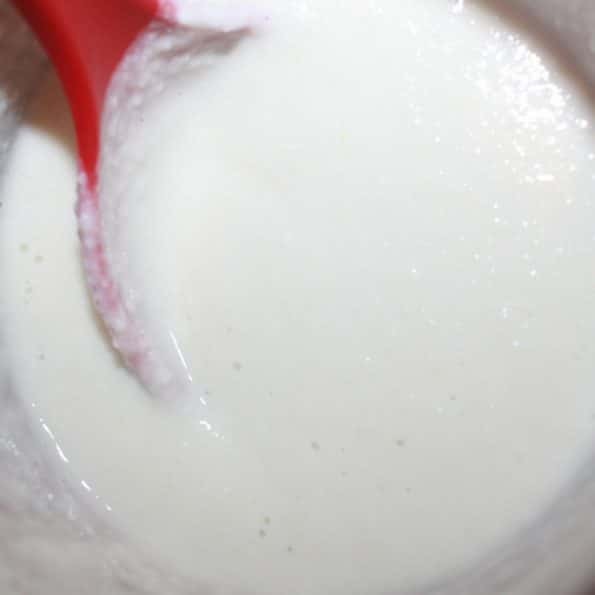 This same idli batter can be used to make dosa as well, however to make the perfect dosa batter which will make thin crispy dosas, add little water (say 1/4 cup for every 1 cup idli batter) to the idli batter to make it more dilute so you can nicely spread the dosa batter in the iron griddle or non stick pan to make delicious dosa. Making idli dosa batter needs a little more attention if you are living in a cold country, as I do now. Initially I found it difficult to make the idli dosa batter in the cold climate, especially during the very cold winters as the batter won't rise easily. What I do is as soon as I make the idli dosa batter, I transfer the batter to an oven safe bowl (I use large steel bowl) and preheat the oven to 350 degree for about 1 minute (if you overheat it won't be good for the batter, so if you overheat it accidentally, let it cool down a bit for few minutes as you only need a mild warm temperature inside the oven). After 1 minute of preheating the oven, I switch off the oven and place the bowl of batter inside the slightly warm oven. Let it sit there for about 20 to 30 minutes. You may also use the oven light for best results. After letting the batter sit in the oven for about 30 minutes, I take out the batter, transfer it to any container that I want to store the batter, mix well and leave it in the kitchen counter where it will sit and the batter will rise as usual in about 6 to 12 hours of time. That way you do not have to block your oven for the entire night until the batter is fermented, so your oven is free after a minutes and you can use the oven for any baking. Hope this works for you as well. Hope you found this post on idli dosa batter recipe useful!